A new Proposal to Modernize farming In India and end Farmer suicides. The new idea to solve the problems of farmers is as follows. Milestones that can be achieved : Banks spared from Loan losses, rural employment, Evolution of new business models, increase in soil fertility, crop yields due to scientific farming methods, agri-soil data analytics, climate analytics, productivity gains in food supply logistics, new startups possibility and rural villages will thrive. Reduction/Elimination of corruption in agricultural activities . Small and medium farmers are succumbing to the enormous amount of debts, rising cost of living and failure of crops due to drought or excess rainfall or due to bad quality seeds and poor farming practices. Banks stopped giving fresh loans, the government reimbursements end up paying old debts, fertilizer prizes are skyrocketing and private loan sharks loot whatever is left with the poor families of the farmer. Banks targeted loan payments is 15, 000 crores but they disbursed just 6000 crores according to a regional newspaper article (link provided below). Even if farmer succeed to raise crops the middle men robs the profits by paying a fraction of the amount and making bumper profits from the sales of the farmers yields in the open market. This is because all these small farmers do not have the financial leverage to store their produce nor to take it to the markets and sell. On top of it the politicians use the situation for their advantage in the form of short term popular policies to garner more votes. They do not sincerely show empathy, passion to solve the problem. Even if they announce policies with good intention there is no strict follow up to the end and in the name of these policies political and middle men swindle more money. In a nutshell there is no proper planning/auditing till the “LAST MILE” in everything the Government does constantly for ever. The consequences: Due to above factors and many other reasons farmers are attempting suicide and families are coming on to the roads. The situation is grave in many southern states such as Andhra Pradesh, Telangana India. In regional newspaper (http://eenadu.net/news/newsitem.aspx?item=hyd-panel&no=1 ) the following statistics are given about the farmers suicides. In the above states since 1997 till 2013 the suicides have risen from 1097 to 2014 and during 2015 there are around 1000 suicides. The situation is becoming worse for the farmers who feed the nations billions of people. Government implements popular measures of reimbursements, short term help to farmers in the form of subsidy and other methods. All of the present methods are short term solutions without any substantial benefits to the farmers for long term. The policies of the government appears as a reaction measures only not preventive measures. Opposition parties try their best to gain sympathy for more votes for their future elections from this fiasco. Some of these reimbursements end up with several rich farmers, politicians, their coterie of gangs and fake account holders who capitalize on these more than the real farmers who needs them. The whole system of reimbursement is full of looting and exploitation by some vested interests starting from the politician to influential people in the society. The same thing happens in several other infrastructure developments, where government money is spent. These cartel of powerful politician, businessmen and their coterie of gangs make the most of every developmental work in India. The results of the infrastructure development is of low quality work and creates bad image about the country to outsiders. To solve the vexing problem I propose the following solutions. The gist of the proposal is to change the language and the perception of problem definition in order to get a right solution. I redefined this problem from a corporate perceptive and framed my question of the problem. The question is now reframed as follows. By focusing on the problem in several other form of questions as above I could come to the following solution. If implemented this will solve several problems, country like India faces. My purpose is to bring agricultural practices to a level playing field across the country with global best practices implemented with grassroot realities and development. Under national skills development program train students/ others who are interested in Agriculture to modern farming methods sourcing the best practices from countries such as Israel. Educate the farmers to outsource their lands for a fixed amount payable quarterly or half yearly. The land still belongs to them but the work is outsourced to professional farming companies. Pool all the small and medium farmers’ lands together to make a large agricultural land available for large scale farming with most modern methods sourced from across the globe. Use the trained students / others / owners of the farm lands to work in the fields with the best international practice implementations. Pay for their work as regular salaries or for a fixed price. Job creation for rural youth. Rope in venture capital funding agencies, businesses and global equity / money market funds and encourage them to invest in agriculture with tax benefits for the investments. Allow start up entrepreneurs work closely with cultivators to come up with new apps, products , services , storage facilities, logistics and other closely related works with venture funds made available for them. Support start-up companies that handle the logistics of preserving the food grains , transporting food till it reaches every house hold. Let government not involved in the whole supply chain logistics including the Last Mile but make sure to monitor strictly the whole process with regular checks and cross checks. Farmers are assured with fixed incomes from their lands. Banks need not take the burden of non-payment of loans nor they need not allocate huge amounts for loans and end up with NPA’s (Non-performing assets). Eliminate middle men, brokers from the food supply chain. Provide opportunities for start-up business to flourish which will in turn gives more employment to rural youth. 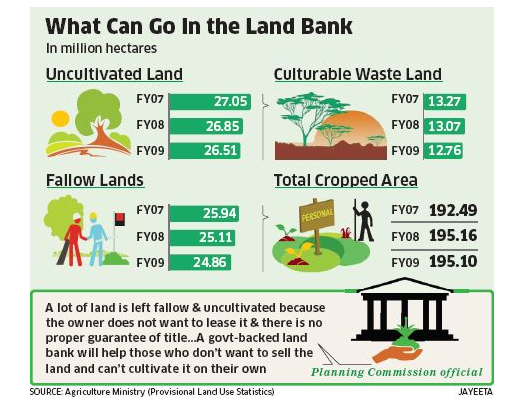 Land pooling will help in producing more and diversified crops with yields better than segmented pieces of lands cultivation. Misuse or excess use of fertilizers, chemicals, and pesticides can be eliminated since the farming is done by professionals. Helps in streamlining of food supply chain logistics and encourages ancillary units development in and around the villages. Local youth will become productive by honing their farming skills in the national skills development program and they get exposure to industry best practices. Solves unemployment and youth turning to crime problems. Helps entrepreneurs to come up with more start up ideas around agriculture with agricultural e commerce , apps development in ebay like auctions to flipkart like retails sales. Provides opportunity for new business models to evolve from this. With further honing of the above idea Government can focus on support and sustenance of the projects and private professional players taking care of the real work. Slowly government can untangle from Commerce /business completely, by gradually outsourcing all the work to outside agencies and that will reduce the corruption in the country to a large extent. I felt this is the best method to end Corruption in the country because the roots of all corruption starts from powerful politician, businessmen and percolates down to different government agencies.